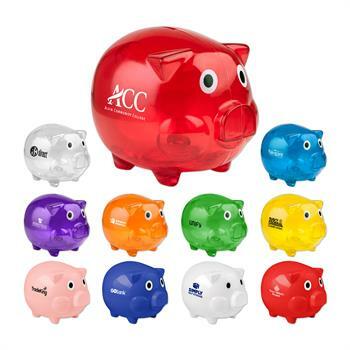 Save your pennies for a rainy day with our best selling 5" piggy bank. Our pig banks help encourage saving in young children and feature a twist plug to retrieve the money. Great for banks, financial institutions, credit unions, mortgage companies, real estate offices and more. Plastic. Available in blue (S16105X), clear (S5465X), pink (S5546X), red (S16106X), translucent blue (S5464X), translucent green (S7670X), translucent orange (S7669X), translucent purple (S7667X), translucent red (S5463X), translucent yellow (S7668X), and white (S5694X). Imprint Size : 2" x 1 1/2"